In its third successful year, Santander, in partnership with People’s Palace Projects, is once more offering 6 grants for QMUL students to spend a life-changing time in the favelas (shantytowns) of Rio de Janeiro with Grupo Cultural AfroReggae in July 2017 (1st to 9th). This is a unique opportunity to work alongside some of the world’s greatest cultural warriors, as they fight for social transformation through art. 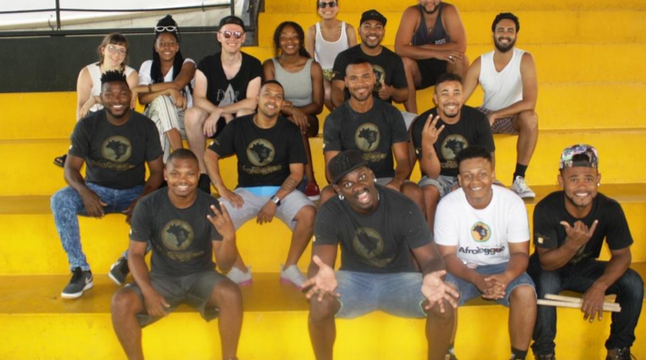 In September last year, 6 students from QMUL’s Drama, Geography, and Politics and International Relations Departments had the opportunity to support the AfroReggae team in action in their 4 different headquarters across Rio, in a full week filled with exhilarating experiences. You can read some of their insights about the visit here. 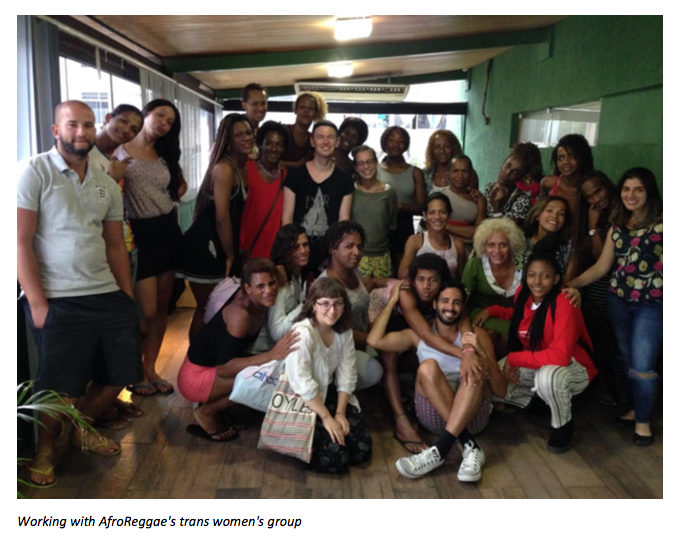 Grupo Cultural AfroReggae is a Brazilian cultural group from Rio de Janeiro that harnesses the ingenuity and creativity of Rio’s favela (shantytown) communities to provide positive social alternatives through arts and culture. 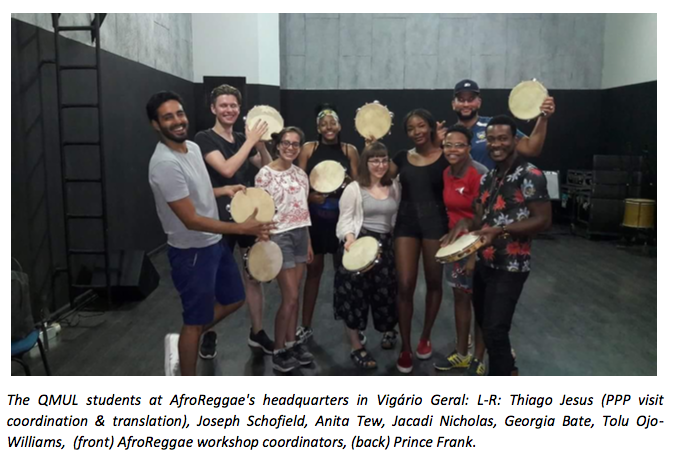 Forged out of a police massacre of 21 people in their local community, Vigário Geral, in 1993, AfroReggae has gone on to establish an international profile for its pioneering work in taking young people out of drug/gang culture. People’s Palace Projects (PPP) is a research centre and charity based at QMUL, advancing the practice and understanding of art for social justice. We have worked in partnership with AfroReggae in the UK since 2006. For 8 days in July (1st to 9th), 6 QMUL students will have the opportunity to work alongside AfroReggae in the favelas of Rio de Janeiro. The £1,600 grant is designed to cover international flights, accommodation and subsistence in Rio de Janeiro, and is open to all QMUL students, both Undergraduate and Postgraduate. Speaking Portuguese is not essential, as there will be a translator available as part of the costs of the trip, but students with language skills may wish to consider using the trip as an opportunity for an extended stay in Brazil or Latin America. This is a wonderful experience for students looking to gain experience within arts & social projects: preference will be given to applicants who can say what they want to learn from AfroReggae and how they want to put it to use in community work in the UK or internationally. We especially welcome applications from students with experience of children’s social care. Applications must be submitted until 17th April 2017, 6pm. Shortlisted students will be notify via email and must be available to attend interviews held at People’s Palace Projects office on 1st May 2017. Final selected students will be notify by 2nd May 2017.